The seat warmer is provided to warm the front seats during cold weather. 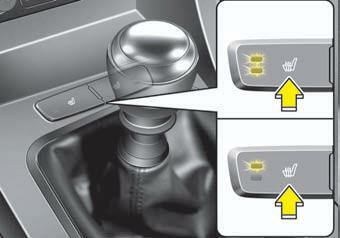 While the engine is running, push either of the switches to warm the driver's seat or the front passenger's seat. During mild weather or under conditions where the operation of the seat warmer is not needed, keep the switches in the OFF position. 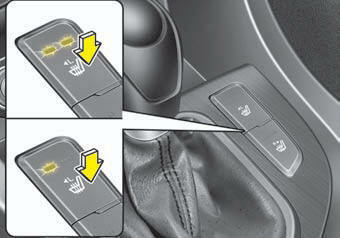 • The seat warmer defaults to the OFF position whenever the ignition switch is turned on. With the seat warmer switch in the ON position, the heating system in the seat turns off or on automatically depending on the seat temperature. When cleaning the seats, do not use an organic solvent such as paint thinner, benzene, alcohol and gasoline. Doing so may damage the surface of the heater or seats. To prevent overheating the seat warmer, do not place anything on the seats that insulates against heat, such as blankets, cushions or seat covers while the seat warmer is in operation. Do not place heavy or sharp objects on seats equipped with seat warmers. Damage to the seat warming components could occur.